Let’s face it, no one wants to spend 40 hours a week in a dingy old cubicle. In recent years, many companies have moved from the classic cubicle to open work spaces. While these spaces may be trendy and help boost creativity, they’re also a breeding ground for distracted and unproductive employees. It may seem like a lose-lose situation, but there are ways to create an office environment where employees have a choice between an open-air working space or a modern cubicle that they won’t dread sitting in all day. Here are three ways to modernize your cubicles so your employees don’t feel like they’re wasting away in isolation. Glass cubicles are the modern version of the traditional fabric cubicle. These modern cubicles still offer privacy and allow employees to focus on their work like traditional ones, but they also blend seamlessly with an otherwise open-air office. The glass allows light to flow through both the office and each employees’ working space, creating an open, welcoming environment and reducing the electricity bill. These cubicles are also more aesthetically pleasing than their fabric counterpart. Entering an office building and seeing a sea of fabric cubicles under dimmed overhead lighting can be depressing, and you don’t want to give that impression to clients or potential employees. 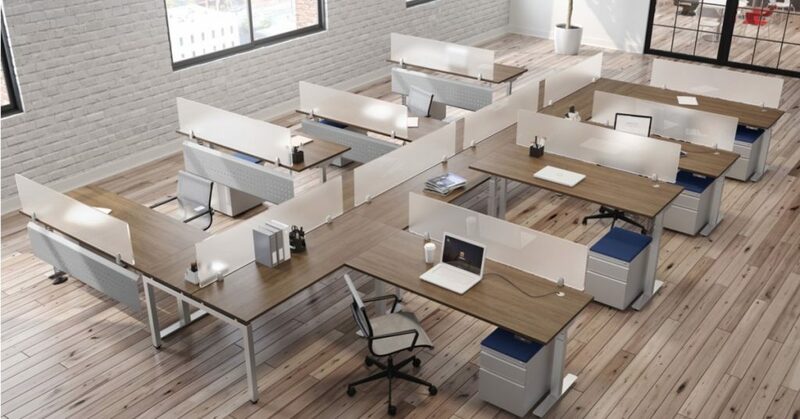 The norm among offices is to have a one-size-fits-all cubicle but incorporating staggered heights in your office gives your employees different privacy options and brings variety into your office. There are three sizes that are regularly used in offices. Most offices use cubicles that have 42”, 53”, or 66” walls. Depending on what kind of company you have, one of these options may be best for your whole team or you may want to mix them up depending on the employee’s position or team needs. For example, 42” cubicles offer little privacy and employees can easily see each other when they lift their heads. This option would be best for offices or teams that regularly need to collaborate or communicate in person. On the other hand, 53” or 66” cubicles offer varying levels of privacy and are beneficial for employees who are often on the phone or who work with confidential client information. Providing differing heights allows employees in different positions a space that caters to what they need throughout the work day. If you think your company would benefit from an open-air layout but you still want your employees to have privacy if necessary, create a flexible work environment where employees can choose where they work. If employees have laptops, they can decide between the privacy of a cubicle or an open layout that promotes collaboration. This way, employees have the freedom to determine what environment would best suit them depending on the day, the amount of work they have to do, and the type of work they’re doing. Determining what type of cubicle is best for your office can be stressful, which is why we’re here to help. Stop by our showroom, and we’ll work with you to figure out what options will best fit your company’s needs.